The Hairst is a unique annual harvest festival taking place in Huntly. This family event, established in 2002, celebrates the food and traditions of Aberdeenshire. It has something for everyone, from an extended Farmers Market with over 50 stalls showcasing the best of local produce to cookery demonstrations and competitions, including The World Stovies Championship. There will also be farm tours and exhibitions and the very successful annual Tin Hut Supper. Huntly's Room to Run event is also taking place on the same day. 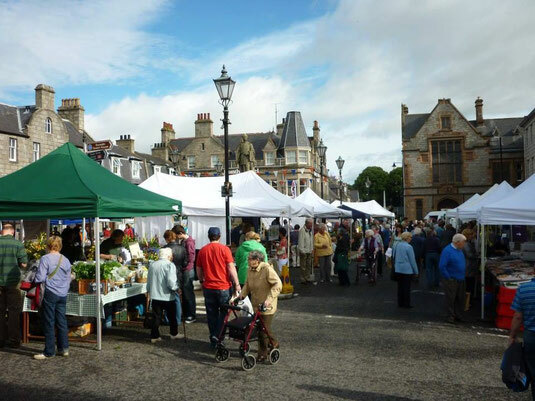 The Festival is organised by a group of volunteers who give their time to promote the produce and producers of Aberdeenshire and provide an enjoyable event for local residents and visitors. is held on the first Saturday every month, except January, in The Square, Huntly. All stalls are showcasing and selling locally grown, reared, made or caught produce. The stall holders pride themselves in the high quality and offer customers the opportunity to learn more about the provenance of their products. Hot food and hot drinks (and in summer freshly squeezed juices) are also on sale at the market. The Huntly Room to Run takes place alongside the Huntly Hairst and has a range of races for all ages and abilities. All races are now fully booked. For more details visit the Room to Run website.